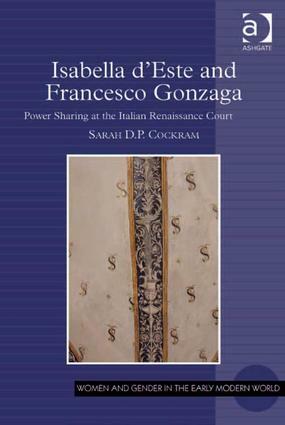 In the first book systematically to give evidence of conjugal co-rule at an Italian Renaissance court, and the first full length scholarly study of Isabella d'Este and Francesco Gonzaga, Sarah Cockram shows their relationship in an entirely new light. The book draws on (and presents) a large amount of unpublished archival material, including almost unprecedented surviving correspondence between and around these Renaissance princely rulers. Using these sources, Cockram shows Isabella and Francesco's strategic teamwork in action, illuminating tactics of collaboration and dissimulation. She also reveals behind-the-scenes diplomatic activity; court procedures; sexual politics and seduction; gift-giving and network-building; rivalries, intrigues and assassinations. Several epistolary themes emerge: insights into the couple's communication practices and double-dealing, their use of intermediaries, and attention to security matters. This book's analysis of Isabella's co-rule with her husband, supported by other members of the Gonzaga dynasty, sees her sometimes in the role of subordinate partner, sometimes guiding the couple's actions. It shows how, despite appearances at times, the couple shared common diplomatic policy as well as human, material, and cultural resources; joint administration; and the exercise of authority and justice. Thus emerges a three-dimensional picture of the mechanisms of power and power sharing in the age of Machiavelli. Contents: Introduction: Letters and lies; Power sharing; The elimination of threats to the Marchesa’s authority; Disgruntled diplomats and scissor attacks: divided fronts in the court environment; International diplomacy: the Borgia menace; Overcoming tension and troubles; Conclusion; Appendix; Bibliography; Index. Sarah D.P. Cockram is a Leverhulme Early Career Fellow in the School of History, Classics and Archaeology at the University of Edinburgh, UK.